After a long period of cloudy skies, it finally cleared last evening. Not in time to catch satellites, but in time to catch comet 17P/Holmes. Comet 17P/Holmes dramatically brightened a week ago, from mag. +16 (!) to mag +2.5 (!!). That is spectacular and no other comet is known to do this this dramatically. Yesterday the skies cleared only after the moon was already up. 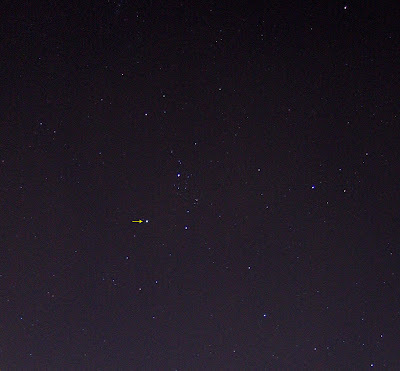 Nevertheless, and nothwithstanding my location in the middle of a town center, I could easily spot the comet with the naked eye as a bright "fuzzy" star just east of the alpha Persei group. In my 20 x 80 binoculars, it was a very bright nebulous globe. There is no sign of a tail, only a round coma some 20 arcminutes in size. In wide field pictures, the object appears stellar due to this reason. Below image is a "stack" of three 10.7s images with my Canon Digital Ixus 400 pocket camera on a fixed tripod (so no guiding).